I am really, pretty non-committal. The thought of getting a pet freaks me out, what with all the tied down-ness and years of obligatory feeding, bathing and medical care. So it goes without saying, I could never, ever go under the needle and get a tat*. Thankfully, the universe has blessed us pussies wimps with henna art. I scored a henna tattoo, or mehndi, on my hand last Thursday at the Social Luxe party/BlogHer '09 kickoff. What? you say. Last Thursday? And it's still ON??? Before you jump to any conclusions about my grooming habits or ability to repel germs without soap and water - YES, I am still routinely washing my hands after trips to the restroom. YES, I am still routinely bathing with body wash, shampoo and conditioner. I'm not in need of a flea dip or anything, people. The henna artist told me the tattoo would last for a week or so with special care (no rubbing or exfoliating the area) and extra moisturizing - so, that's exactly what I'm doing. 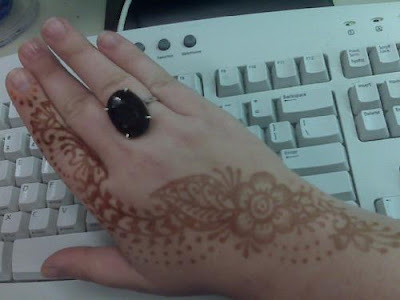 I think it looks so cool that I am trying to find a local henna artist who can give me a mehndi fix on a regularish basis. *I'd consider getting a Celtic tattoo in honor of my niece, but that's pretty much the only circumstance worthy of subjecting myself to poking and prodding with needles full of ink. it's not so bad, if I can do it, you can do it! I really like ACME and designs by dana.